Pipe comes in many shapes and sizes and can be found almost anywhere. For dioramas and model railroads, it is an easy scenic detail to make for yourself. Pipes make excellent scenic details for trackside, mills, scrap yards, construction scenes or of course as open loads for freight cars. The techniques and materials shown here will work for most scales―only the relative diameter of the pipe will change. You can find parts to make pipe at your local hobby shop. Most shops will have a good supply of plastic tubing along with other structural shapes. This plastic is relatively cheap and comes in a good assortment of sizes and lengths. One drawback, however, is the thickness of the material. Thicker styrene tubing works well for simulating concrete pipe but is a little overscale for steel. You can carefully reduce the profile of the pipe at the ends with a sanding attachment. This plastic is relatively cheap and comes in a good assortment of sizes and lengths. One drawback, however, is the thickness of the material. Thicker styrene tubing works well for simulating concrete pipe but is a little overscale for steel. You can carefully reduce the profile of the pipe at the ends with a sanding attachment in a rotary tool. Brass tubing is also commonly available. This has a much thinner profile and like the plastic can be painted in any color to represent the pipe of your choice. A drawback, however, is the price. The cost of the tubing can really add up. Also, if you are using the tubing to make a load for a freight car, the weight of multiple brass tubes can be more than you'd desire. Fortunately for modelers, some of the most realistic material for piping is also the cheapest. You won't find it at your hobby shop or hardware store; you'll have to check the supermarket. If you're looking for plastic tubes with a thin profile, a size that works well in most scales and a cost of just pennies a piece, it is hard to beat the standard drinking straw. These straws come in a limited variety of diameters. A box of 100 can usually be found for about the cost of a single brass tube—or less. Coffee stirrers can also be used for smaller pipes. To convert the straws into a steel pipe, first cut the straws to length. Use a sharp hobby knife and take care to keep the cut square. Inexpensive spray paints can be used to color the paint. New pipe usually is shipped in a variety of colors. Gray, black, light green and rusty brown are common. Spray the paint evenly around the entire straw. If you are painting multiple pipes at once, a quick and simple jig can be made by nailing some small nails into a scrap of wood. Leave enough space between the nails so that the paint can hit all of the pipes. Simply place straws over the nails and spray. You'll need to flip the straws once to get paint around and into the other end. Allow the paint to dry fully before installing it in scenery or gluing in together to make a load for a flatcar or gondola. 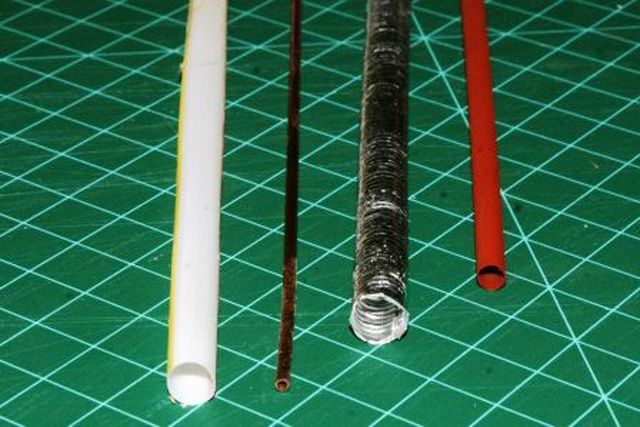 Soda straws are an obvious choice for smooth pipes, but what about the corrugated steel pipes often used to make culverts or pouring forms for foundations? There is another inexpensive trick to making these as well in almost any size you could ever need. All you'll need is some aluminum foil (get the heavy-duty variety), a hobby knife, straight edge, white glue, and a bolt. Choose a bolt, or bolts with a diameter that works for your scale and project. Use a straight edge to cut a rectangle slightly longer than your finished pipe and wider than the circumference of the bolt. Wrap the foil around the bolt. You can wrap the foil more than once for increased strength. Most foil has a shiny side and a flat-finished side. Either can be used for new pipe, but if you plan on adding any paint or weathering, wrap with the dull side out. As you wrap the foil around the bolt, use a small amount of white glue where the foil overlaps to prevent it from unraveling once complete. Create the corrugations by pressing the foil into the threads of the bold with your fingernail. Gently twist the foil pipe off of the bolt when finished. If desired, you can paint and weather the pipe. You can also add bends, dents, etc. to represent older or scrap pipe. You can turn out a carload of culvert in no time with this method. Best of all, you can have some wonderful scale details for pennies.